Note the wound tracking section in the lower left… one of the earlier examples of the mechanism, most commonly associated with Shadowrun. The setting of Chill is prototypical gothic horror on an alternate Earth inspired by Shelley, Stoker, and Poe: vampires, werewolves, mummies, ghosts, goblins, and ghouls, oh my! The basic rules accommodate nearly any time and place from Victorian Europe to modern day America, from gas lanterns and horse-drawn carriages to nightvision goggles and souped-up hot rods. It doesn’t really matter… the creatures still have a massive advantage, being immune to nearly everything. Chill, like all the Pacesetter titles, uses a range of attribute scores a little different than normal. Typical character values are generated by rolling 4d10 and adding 30, a range of 30 to 70. This feeds into the skill system, where the base percentage chance of success with any skill is based directly on an average of 2 or 3 attribute scores. Applying this mechanism to this specific range of values gives characters a logical and fair chance of success (and failure) without need for an extensive skill definition process, a nice touch. Chill’s skill system is quite basic, yet offers a fair chance for character’s to distinguish themselves in various endeavors. Skills can be developed to 3 basic ranks: Student (+15), Teacher (+30), and Master (+55), with the noted bonuses applied to the base chance of success determined from attributes. Task resolution is accomplished through a color bar chart mechanism (somewhat of a fad of the time, as I recall). 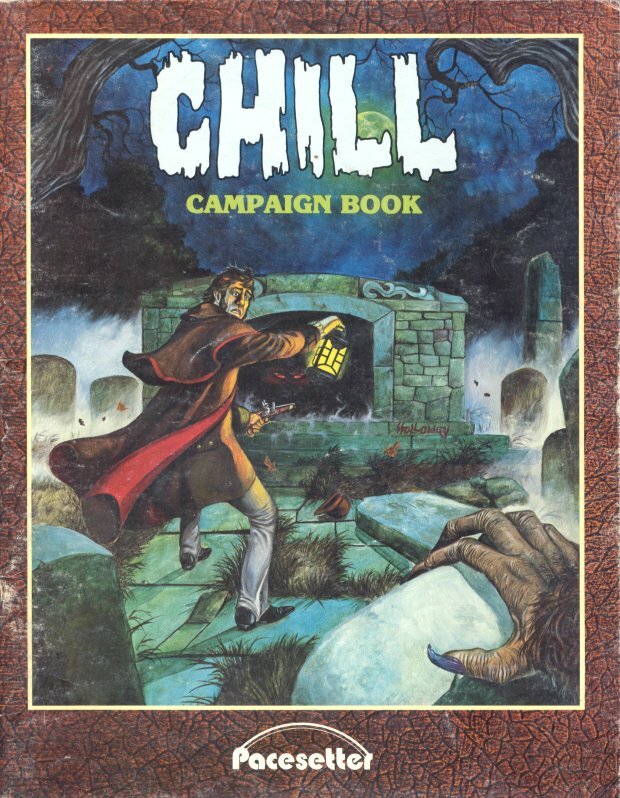 A skill check in Chill is a roll of percentile dice (1d100). If the roll if less than the modified skill score, the difference between the value rolled and the needed score determines the “Attack Margin” row used on the table. The Defense Column is determined based on the situation (ranged attacks used a 1d10 roll, while melee attacks used the defender’s relevant combat skill divided by 15, for example). The code at the convergence of the row and column yielded the result, which could range from “S” (scant damage/scratch wound) to “C” (crushing damage/critical wound). Nearly all skill checks could be resolved in the same manner, contested or not, with the selection of Defense column being the manner in which the difficulty of the attempt was established. Characters aren’t totally left to the tender mercies of the beasties with naught but the mundane to defend themselves, however. Characters have the opportunity to develop disciplines in the Art, a pseudo-magical set of abilities that helps slightly to level the playing field against creatures that can summon hurricanes and stop time, amongst other things. Character development in Chill is as straightforward as the rest of the mechanics. 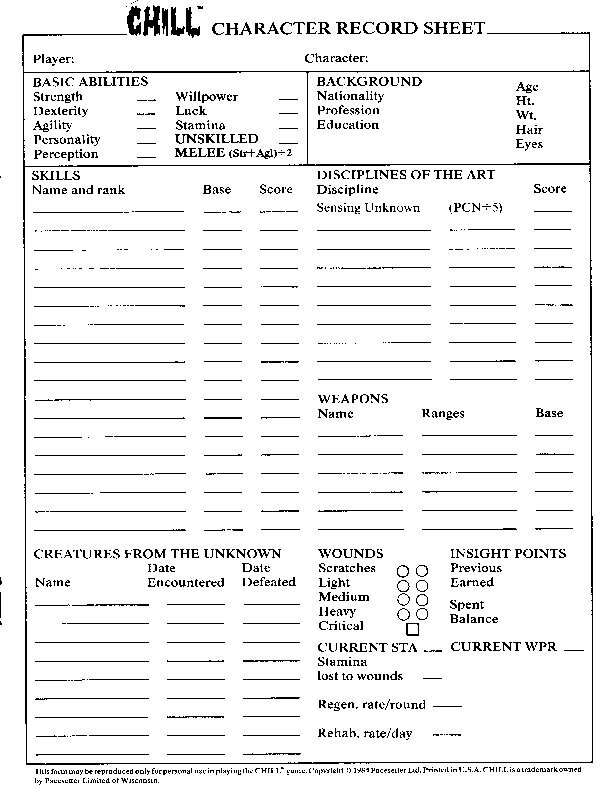 The gamemaster grants a number of Insight Points per session and/or challenge, and the character uses those points to purchase skills, attribute points, and/or additional disciplines of the Art. Easy enough. Pacesetter was the original publisher, but the Chill title has changed hands a few times over the years. After a brief stop at Mayfair Games, with a slew of updates and changes (for example, the Action Table is history, details here) it is currently being updated and repackaged for new publication by Otherworld Creations, Inc. The new version will be compatible with the Mayfair version, according to the latest news from Otherworld. Some additional details and links related to the new version can be found at the Chill RPG web site. I’m glad you chose to look back at the Pacesetter edition of CHILL. This was the fun one, Hammer Film inspired from a time before horror became hip. I don’t know what Mayfair was thinking. Even though I only managed to get one game of it going, it was still one of my favorite game systems of the 80’s. The mechanics were a bit shoddy, but man it’s books were fun to read. Agreed. It’s been a while since I actually got to play, but it was one where I was always watching for the source material, even if I never planned to use it, because it was so interesting and well done.